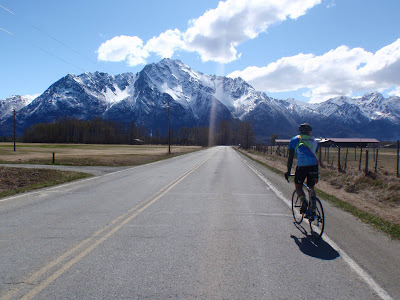 One of the things I am really hoping to do this summer is several bike tours around Alaska. In order to tour the trails and roads of this great state, however, I must first figure out how to leave the city of Anchorage on a bicycle. So as soon as I came to town, I started asking around about the best way to ride to the Mat-Su Valley. The responses were surprising: "What do you want to ride for the Valley for?" "Oh, you'll have to get on the New Glenn Highway for most of it," and, "I don't think you can do that." Really? 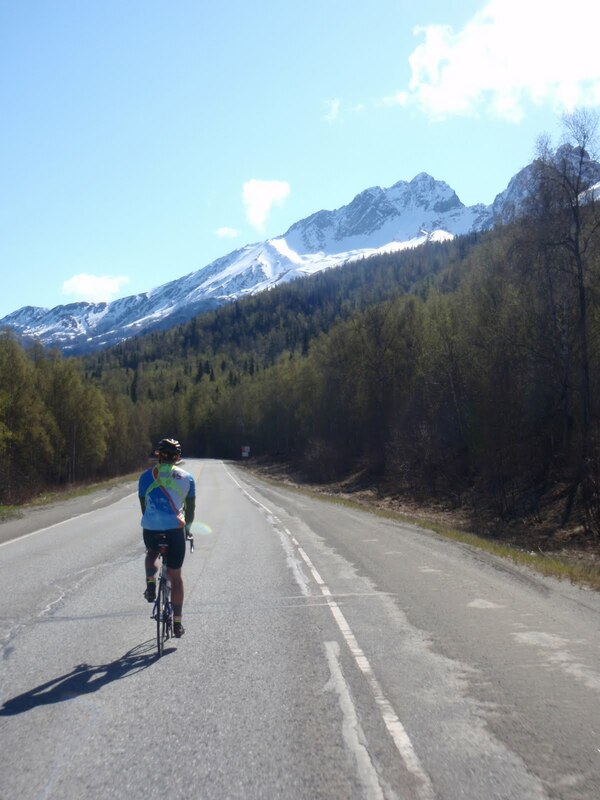 In all of Anchorage, no one regularly rides bicycles to the Mat-Su Valley? It seemed implausible. It's the only way out going north. And as someone who spent the last four years in a place where the only road out of town dead-ends after 45 miles, I could not fathom how all of the people I asked about that ride had never even been remotely curious about it. Suddenly, the simple act of riding a bicycle to the Mat-Su became a challenge. I casually mentioned it to my friend Mark in Eagle River, and he replied, "I have always wanted to do that! It would be like PBP (Palmer-Birchwood-Palmer, which is a real event, so I guess organized rides to the Mat-Su do exist), only backward!" Only we didn't know the way. Our only agenda was to stay off the New Glenn Highway as much as physically possible. 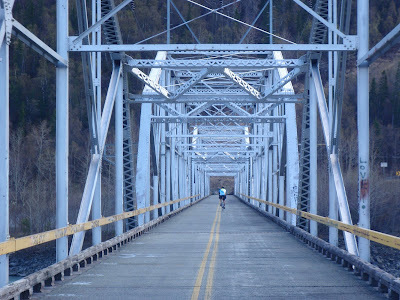 We started in Eagle River and made our way north on the bike path. After that ended, we made a few unnecessary detours up into the hills, often being forced to loop back to where we started (Mark started labeling these side-trips "Adventure One, Adventure Two, etc.") We hopped a gate near Mirror Lake and made another meandering trip into the community of Eklutna. We were finally forced onto the New Glenn, skirting a gravel-coated rumble strip as trucks streamed by. But that was only for a mile. We jumped off at the next exit, found suitable back roads for a few more miles, conceded to the New Glenn for another mile or so, before finally connecting with the Old Glenn and our free back-road passage to Palmer. This weekend I attended the 2010 Alaska Press Club conference. The introductions were a little awkward at first - "I used to be an editor for the Juneau Empire, but, um, now I'm not." When the notion of a voluntarily unemployed journalist was met with slack-jawed stares, I sometimes even added the qualifier, "Yeah, I left for personal reasons, not professional ones." But as the workshops progressed, the more people I met that still gave me a card and said, "Send me an e-mail; we;'ll talk," the more comfortable I felt saying, "I'm a freelancer." Even though I don't have much to back up that statement yet, I stopped feeling the need to apologize for myself. The last time I attended the conference, in 2007, the atmosphere was decidedly more grim - along the lines of "Blogs and Craigslist are closing in and journalism is dying." This year, the mood was more, "Journalism is dead! Long live journalism!" It says a lot that our keynote speaker this year was a guy from Twitter. More and more mainstream journalists are embracing the new model, which is that there's no model at all. Journalism is simply the art of telling stories, in any way one wants to tell a story. I attended a workshop titled "Entrepreneurial Journalism," where the presenter proudly listed all of the failed magazines and start-ups she had been a part of before the successful one she landed in. Her theme was "%$@# Fear." "Think up an idea, and try it," she said. "What have you got to lose?" She asked me what my idea was and I told her my story of a decade of working for community and daily newspapers before landing open-ended in Anchorage. "But I also have this blog," I continued, "About living in Alaska and endurance biking." "There you go!" she said. "That's you! Use that!" The hope and enthusiasm was contagious. I was frantically typing ideas onto my laptop as fast as they occurred to me. Some of them were way out there. Most of them were way out there. But for all of my life, I have always been a person that said, "I could never do that." Now, I'm beginning to ask myself "Why not? Why couldn't I do that?" Just as I've had to do so many times in my endurance biking, I'm beginning to look into the heart of my anxieties and saying "%$@# Fear." Tonight I attended the awards banquet. The Empire couldn't afford to send anyone out to the conference this year, so they asked me to step in for them in proxy. It was a jovial setting, and the Empire pulled in an enormous number of awards - 21 in all. I won third place in "Best Page Layout and Design" and first place for "Best Graphic." Best Graphic! That's competing against all of the newspapers and magazines in Alaska. First place! I was stoked, because I'm not even a graphic designer ... anymore. But that's OK. I can still be a graphic designer, and a layout artist, and a Web master and a writer and photographer. I can be anything I want to be, and that's why I'm going to succeed in the new world of journalism. $%$@# fear. Right on! @#^& Fear indeed. Love your blog...long time reader, first time commenter. Love the message... @#^& Fear! As someone who just made the leap herself, this post really hit home! Congrats on the awards! So awesome! Some bloggers like Dooce and The Pioneer Woman make huge amounts of money off their blogs. However, those blogs have loads of ads on them. Some blogs have contests and give aways. The advantage of a blog is that, obviously, you can be anywhere to write your posts. Bert Gildart, on the other hand, is a freelance travel writer. 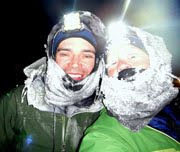 He submits his stories to numerous outdoor magazines and also maintains a blog. He travels around in an Airstream, although he has a sticks and bricks house in Montana. Many rvers sell everything and move into their rvs. Many of these 'fulltimers' maintain blogs, too, and several make money at the same time. So, you could buy an rv, live simply, travel from bike event to bike event and write about it. Then you could work to get a huge readership, make a fortune and retire early. Oh well, it's an idea. the 'new media' - I think I hate that term - truly suits someone with a diverse set of skills. So as a graphic designer, layout artist, web master, writer and photographer, I think you are setting yourself up for success. Yes, it's true, your job title does not really define you! Your actual skills do. So you're still a graphic designer, I think. For someone who describes herself as sort of timid, you sure have pursued a lot of things with full force! The enthusiasm you caught at the conference was passed through your post and onto your readers. It was sure nice to get a little boost on Monday morning. Good luck - I see success not only in your future, but in how you're living your life, right now! Long Live the Valley Trash! Yeaaaahh, I'm so glad you got a big dose of that right now. Great timing! As LoJo says above "long time reader, first time commenter." Found your blog through Kent's blog. His post from May 9 has a quote that fits in well with your post - "...folks like you, going out and doing things, are what inspire folks to go out and do things." Thanks for the inspiration and hope you find your inspiration. P.S. My cousins live in the Valley. Congrats on the awards Jill. We all know you rock - sounds like you might just be figuring that out. Can't wait to see you soon!